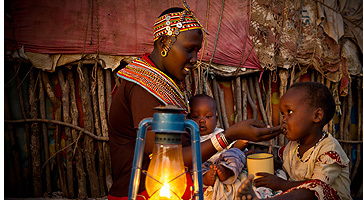 Step 1 (Targeting): When beginning work in a village, BOMA first meets with community leaders to discuss collaboration. We also conduct a Village Assessment to gauge whether the local economy can support REAP. Once we have decided to work in a village, Mentors consult with a BOMA Location Committee (BLC) — comprised of local leaders, former BOMA Mentors and REAP graduates — to identify appropriate participants. The Mentor then verifies poverty levels and collects baseline data with BOMA’s Standard of Living Index. Step 2 (Two Years of Mentoring): The Mentor assembles business groups of three qualified women and helps them to write a business plan. The mentoring continues for two years, including instruction, help in record-keeping, mediation and advice. Mentors visit with each business and savings group monthly. Step 3 (Business Skills Training): Participants receive a skills training class led by their BOMA Village Mentor at the time of the Jump Grant disbursement that discusses the availability of supply and local demand, profit and pricing, record keeping, marketing and savings. Participants are given a record book for their business. Step 4 (Jump Grant): Each business group receives a Jump Grant of $150 to start the business. Grants are disbursed in a public setting and tracked by a strict system of receipts. Step 5 (Savings Group Formation and Progress Grant): Following completion of a Progress Report by their Mentor, each group receives a final Progress Grant of $50 at six months. At this grant disbursement, Mentors introduce the savings program and deliver training (record-keeping, planning for future expenses, assessing loan requests). Mentors then assemble savings groups (three to eight REAP groups), where members meet monthly to deposit or withdraw savings. Mentors deliver nine training modules that include borrowing and lending, planning for long-term expenses (including a section emphasizing the education of all children), loan applications, assessing credit-worthiness, investing, and sustaining the business and savings group after REAP. Step 6 (Secure Savings and Access to Credit): REAP businesses and individuals make regular contributions to the savings pool, which is then used as a source of credit for business expansion and individual loans. Participants have access to credit at the one-year mark and continue to be mentored for another year. From its founding, BOMA has been committed to collecting accurate, comprehensive data that allows us to measure the impact of REAP on the lives of women and children. At program intake, Mentors use the BOMA Standard of Living Index (SOLI) to establish baseline information on participants’ nutrition, household assets and access to education and medical services. Using this baseline data, individuals are surveyed at program exit at two years. The degree to which individuals have progressed out of poverty is judged against nine criteria in five categories: food security, durable asset ownership, sustainable livelihoods, shock preparedness and human capital investment. An individual who has graduated from REAP therefore is reliably food secure, has more productive and household assets, multiple viable sources of income, and is able to successfully respond to shock, collectively reflecting a transition out of extreme poverty.